I'll certainly give it a try. It was a close call in Game 4 against the Cavs, I wasn't playing particularly well and they built that lead rather quickly in the latter stage of the third quarter. It made for an exciting finish but for a while I did feel like the streak was coming to an end. Lamrock wrote: If I were a gambling man, I'd say you're on your way to a 93-5 season. There has been a couple of close calls though, which has been nice. 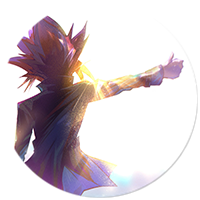 I will be finishing the season in the not too distant future, right now I'm just focusing on content for the newly released games. Maybe some day, but I think I'll at least keep this one going on the side, perhaps with a bit more simming/sim intervention. In any case thanks for checking in, should hopefully get some time to play out the rest of the postseason soon. Came across this linked in a new article talking about Kemp's years with the Cavs. Seems he got himself into pretty good shape shape circa 2006-2008. Guess his inclusion in this Dynasty, his occasional strong performances and the fact he throws down a few dunks for me every now and again aren't that unrealistic. I might still be pushing it with 50+ wins in a row and 92 points for Ben Gordon though. A shame he never could have one last good run in real life. Ah well, there's always this Dynasty. Nice retrospective. Definitely a classic dynasty. Thanks guys, glad you enjoyed it! It definitely was fun to reflect on it, it turned out to be one of my favourite Friday Fives to write in a while. It's been a long time since '06. Having The Reignman here was a huge plus. What's this? An actual update? Yes, I felt inspired to go back and play this one again, if only to finish out Season 2, and see about doing something fun in the offseason. From there, I might sim and play this one a bit on the side. If nothing else, I'm so close to finishing the second season, I figure it deserves some closure. The Philadelphia 76ers put up a good fight, but at the end of the day, the Chicago Bulls took care of business. Ben Gordon scored 26 points and added seven rebounds and 12 assists as the Bulls took a 2-0 lead in their Eastern conference Finals series against the Sixers. Allen Iverson scored 23 points for Philadelphia and Jamal Mashburn had 20, but it wasn't enough as the Bulls pulled away down the stretch. The final score didn't reflect how competitive the game was throughout, as the Sixers managed to keep pace with the Bulls despite the absence of injured forward Chris Webber. Rookie Cory Camara had a solid outing starting at power forward with eight points and 10 rebounds, while putting in an impressive defensive effort against Carlos Boozer, who finished with 12 points and seven rebounds. However, anchored by their MVP, as well as a double-double effort of 16 points and 16 rebounds by Tyson Chandler, the Bulls made all the right moves in crunch time, defending their home court and sending the Sixers home down 0-2. "We know what history says, but we're not thinking too much about that," Sixers head coach Maurice Cheeks told reporters after the game. "They got the first two, now we've got two at home. We just want to take things one game at a time, try to even up this series, and take it from there." Game 3 tips off in Philadelphia in less than 48 hours. The Philadelphia 76ers were the first team to fall to the chicago Bulls as they embarked upon their historic 64 game winning streak, which spanned the final 54 games of the regular season and the first ten games of the 2007 NBA Playoffs. Therefore, it seems only fitting that they were the team to finally bring the streak to an end. Allen Iverson scored 31 points and handed out eight assists as the Sixers protected their home court with a 117-108 victory over the Bulls, who lead the series 2-1. Ben Gordon scored 36 points to go along with 17 assists, but it wasn't enough as Chicago lost control of the game in the second quarter and were never able to recover. After taking a 50-45 lead into halftime, Philadelphia opened the third quarter with a flurry, quickly building a thirteen point lead. Chicago would make several runs throughout the second half, but the Sixers continually recovered. A final push in the last six minutes of the fourth quarter quickly ran out of steam, and Philadelphia cruised to victory. Jamal Mashburn had 22 points, five rebounds and five assists for the Sixers, while Andre Iguodala contributed 20 points, five rebounds, and two steals. Samuel Dalembert had a double-double with 13 points and 11 rebounds. Carlos Boozer and Luol Deng each contributed 16 points and six rebounds for the Bulls in the loss, while Kirk Hinrich had a solid game with 10 points and 7 assists. Many of the Bulls' players were particularly agitated after the loss, a game in which the Sixers attempted 29 free throws compared to only one for Chicago. "It's an almost unprecedented disparity," Bulls coach Andrew Begley acknowledged after the game. 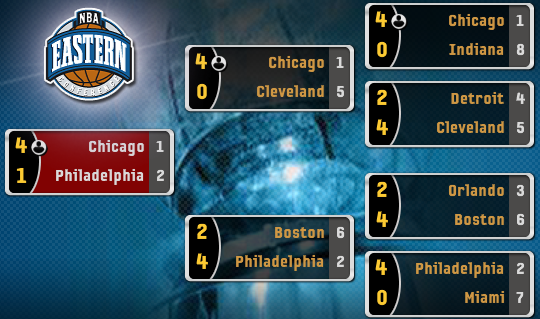 Philadelphia also bested Chicago on the boards, outrebounding the Bulls 48-33. Several Sixers appeared cocky after the win. "They're mortal," Iverson brashly told reporters in the press conference after the game. "Yeah, they've won a bunch of games, but they still have to go through us. We're not gonna just lie down for them." Iguodala asserted that the Sixers can win the series. "We know we can," he said confidently. "Everyone wants to just hand them the trophy. Tonight we showed you can't just do that. We're for real." Philadelphia will host Game 4 in two night's time. The comments that Allen Iverson and Andre Iguodala made after Game 3 didn't set well with the defending champions. Bulls centre Tyson Chandler admitted that before the game, "We were feeling pretty [ticked] off." 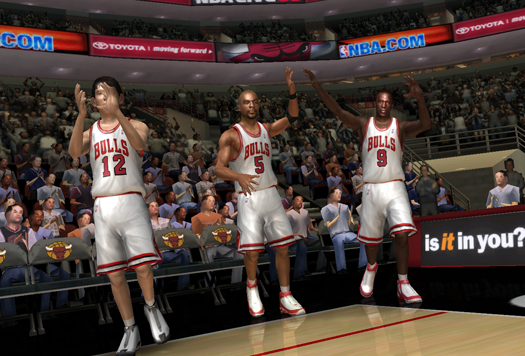 From the opening tip, the Bulls were clearly determined to send a message. They quickly silenced the chants of "overrated" from a hostile Philadelphia crowd, jumping out to an early 14-5 advantage. The Sixers would manage to find their rhythm as the first quarter wore on however, trailing just 29-21 at the break. The lead would balloon to 23 by halftime however, as MVP Ben Gordon put together a solid first half with 10 points, nine assists, and three rebounds. Despite early foul trouble, Carlos Boozer had eight points and six rebounds at the half, and Chicago seemed firmly in control of the game. It looked like it would be a long night for the Sixers. And then, the third quarter began. The Sixers outscored the Bulls 32-16 in the third quarter, erasing their seemingly commanding lead and catapaulting themselves right back into the game. Chicago looked completely out of sync at both ends of the court, and early in the fourth quarter, the Sixers tied the game at 80. Chicago would pull through in crunch time though, finishing the game on a 23-9 run to secure a 103-89 victory, and push Philadelphia to the brink of elimination. Gordon finished with 21 points, 12 assists and six rebounds, scoring 9 of his 21 in the fourth quarter to help put the Sixers away. "We wanted to send a message, but we almost let [the game] slip away," Kirk Hinrich admitted afterwards. "We played a terrible third quarter, and it almost cost us the win. Thankfully, we pulled it together when it mattered." 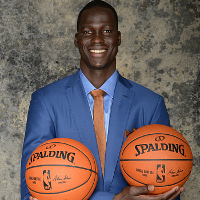 The Bulls received 22 points from Luol Deng, while Chandler had 14 points and 19 rebounds. Boozer also finished with a double-double, tallying 15 points and 17 rebounds. Allen Iverson was quiet with just 14 points, but dished out eight assists. Samuel Dalembert had a big game for the Sixers in the loss, scoring 18 points and grabbing 17 rebounds. Rookie Cory Camara was also impressive, with 18 points and 12 rebounds. The series now shifts back to Chicago for Game 5, where the Bulls will look to advance to the NBA Finals for the second straight season. The Chicago Bulls punched their ticket to the 2007 NBA Finals with a dominant 120-83 victory over the Philadelphia 76ers in Game 5 of the Eastern Conference Finals. 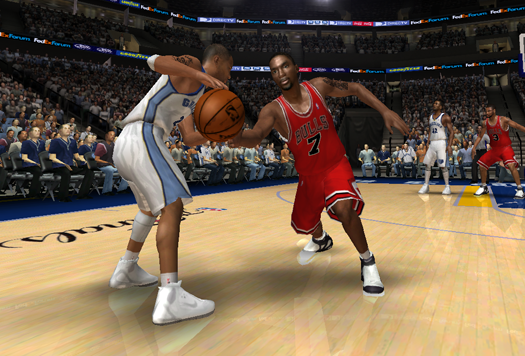 Ben Gordon scored 25 points to go along with 11 assists and two steals as the Bulls ended the series in emphatic fashion. Philadelphia jumped out to an early 9-2 lead, playing with urgency as they tried to keep their season alive. Chicago soon took control, but neither team made much of an effort on defense, leading the first quarter to turn into a shootout. 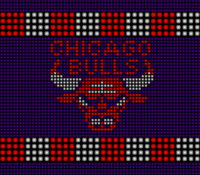 The Bulls prevailed 38-29, which seemed to give them all the momentum they needed heading into the second quarter. Chicago received a surprising lift from Monta Ellis, who scored 14 points in the first half to help Chicago take a 61-44 lead. Ellis would finish with 25 points, to go along with six rebounds, three assists, and two steals, in what may be a breakout performance for the second year guard. Early on in the third, it looked as though the Sixers might make another spirited run to keep the game competitive, but a series of turnovers allowed the Bulls to race away to a 90-65 lead heading into the fourth. Their relentless attack continued in the final period, as they cruised to a 120-83 win. "They wanted to make a statement, and they did just that," veteran forward Jamal Mashburn commented after the game. "We said a few things after Game 3 that got under their skin. We thought we were in their heads, but we just made them more determined. They did a number on us. Hats off to them." Allen Iverson was quiet once again with just 13 points, and was held scoreless in the fourth quarter. Andre Iguodala led the Sixers with 21 points, while also adding four rebounds and four assists. Carlos Boozer had 16 points and 12 rebounds for the Bulls in the win, Kyle Korver added 14 points off the bench, and Luol Deng tallied 18 points, three rebounds, and four assists. Chicago will now face the Memphis Grizzlies in the NBA Finals. Shame that you couldn't keep your perfect playoff record alive, but I guess that is secondary to the bigger prize on offer. Does Ben Gordon have it in him to challenge the NBA Finals scoring record of 61 by Elgin Baylor? Should be easy after that 92 point effort he had earlier in the season. I was a bit disappointed too, but at the same time, the pressure's off and losses make things more interesting. 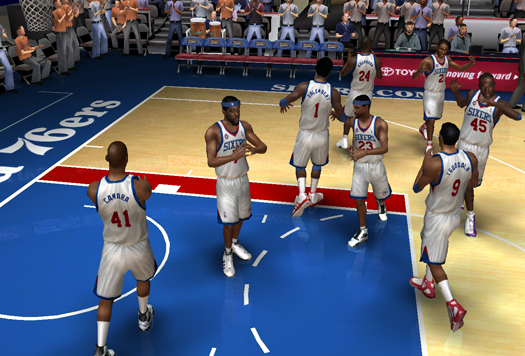 I don't know if it's because I'm a bit rusty with NBA Live 06's gameplay (I kept wanting to throw right stick passes! ), but the Sixers series was a bit more challenging, so it was fun. Gordon actually did that last season. 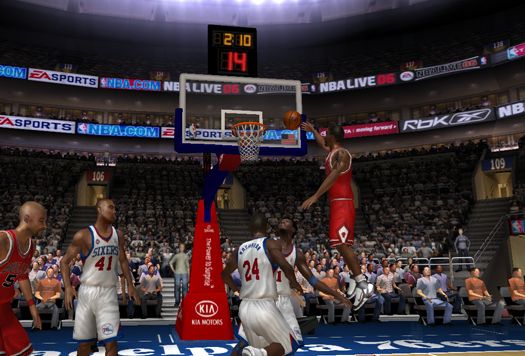 But I can try to best that, since I went ahead and scored the 92 against the Lakers. The Chicago Bulls are making their second straight NBA Finals appearance, having swept the San Antonio Spurs last year to capture the seventh championship in franchise history. The Memphis Grizzlies meanwhile are making their first ever NBA Finals appearance, and will be looking to cap off the best season in franchise history in style. It's been an historic year for the Chicago Bulls. Their 77-5 record during the regular season was an all-time best, edging the 72-10 record the team amassed during the memorable 1996 season. Ben Gordon has also captured the attention of the league and NBA fans worldwide; despite being a noteworthy All-Star snub, Gordon became the first player to capture the league's Most Improved and Most Valuable Player awards, tallying some incredible stats that included several triple doubles, and even a few quadruple doubles. He also scored 92 points in a game against Kobe Bryant and the Los Angeles Lakers. Before losing Game 3 of their Eastern Conference Finals series with the Philadelphia 76ers, the Bulls had won an incredible 64 games in a row. Many had expected Chicago to sweep through the postseason undefeated, but the Sixers' spirited effort ensured that that distinction would continue to elude them. However, there's no denying their dominance or brilliance this season, and it seems that this is a team destined to be something special. With all the hoopla surrounding the Chicago Bulls, it's easy to forget that the Memphis Grizzlies have had a wonderful season in their own right. Entering the league in 1996, the first season the Bulls won 70 games and their fourth Larry O'Brien trophy, the Grizzlies have had a somewhat turbulent history that includes some tough losing seasons, and a controversial relocation from Vancouver to Memphis. After a lengthy drought, the team made their first postseason appearance in 2004, but were swept by the San Antonio Spurs. They were also swept in 2005 by the Phoenix Suns, and last year by the Portland Trail Blazers. 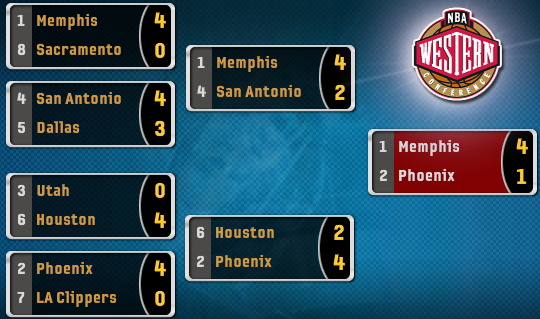 This season, the Grizzlies won a franchise best 59 games, locking up the number one seed in the Western Conference. They swept the Sacramento Kings in the first round, prevailed in a tough series against the Spurs after six games, and defeated the Suns in five games to win the Western Conference crown and advance to the NBA Finals. They face a very tough opponent in the Chicago Bulls, but they don't seem too willing to be a footnote in another team's success story. However, the team will be shorthanded as the series tips off, as All-Star Pau Gasol will likely miss at least the first game with a rib injury. The Sixers managed a valiant effort despite the absence of Chris Webber, but the Bulls appear to be firing on all cylinders following their dominant Game 5 victory. Comments from players on both teams suggests that neither club is taking the other lightly. Whatever happens, the 2007 Finals mark an interesting time in the NBA. Are we seeing the beginning of a new Dynasty? A new rivalry? Will we see the culmination of an incredible season, or will it be spoiled by an underdog opponent? Answers are just a couple of days away, when Game 1 tips off. I may have to disappoint there. NOTE: I should have home court advantage, but NBA Live 06 is one of the games where that's bugged and it always goes to the Western Conference (if I recall correctly). Ah well, if I can finish them off in four or five, I'll be able to do so at home at least. For one quarter, it looked as though the Memphis Grizzlies would give the Chicago Bulls all that they could handle, despite being without star big man Pau Gasol. For one half, it looked as though they'd give Chicago a very competitive game. And then, the clock struck midnight. The Bulls came roaring out of the gate to begin the second half, outscoring the Grizzlies 39-18 in the third quarter to take a commanding lead and ultimately, the victory. The Grizzlies made a spirited 10-0 run to begin the fourth quarter, but Ben Gordon drilled a three from the top of the key to silence the crowd at the FedExForum once again, and spark a run that allowed the Bulls to take the Game 118-86. Mike Miller led the way for the Grizzlies with 21 points, and Eddie Jones scored 10 points in the first half including eight in the first quarter, as the Grizzlies found themselves up 28-27 after the first twelve minutes. They soon found they had no answer for Chicago's offensive onslaught however, as MVP Ben Gordon finished with 31 points, 12 assists, four rebounds, and two steals. Carlos Boozer added 17 points and 11 rebounds, while Luol Deng scored 21. Chicago also made life tough for Memphis at the other end, as Tyson Chandler blocked five shots to go along with his 13 points and 13 rebounds. Brian Cardinal scored 14 points and had 11 rebounds, while Lorenzen Wright had six points and nine rebounds starting in place of the injured Gasol. Damon Stoudamire tallied eight points, three rebound, and a team high seven assists in the loss. "We just had to settle ourselves down," Gordon said after the game. "They came out strong and took us by surprise. You can't underestimate them, just because they're the underdog. That's where we were last year, so we know what an underdog can do. We were able to shut them down [in the second half], and a few more shots began falling for us." Although he hasn't officially been cleared to play as yet, Gasol is strongly expected to be available in Game 2, which tips off in a little under 48 hours. The series will then move to Chicago for Games 3 and 4, as well as Game 5 if necessary. MEMPHIS, TN -- Some good news for the Memphis Grizzlies, who were trounced 118-86 by the Chicago Bulls in Game 1 of the NBA Finals: Pau Gasol is ready to play. Gasol sustained a rib injury during the Grizzlies' Western Conference Finals series with the Phoenix Suns, which forced him out of the decisive fifth game and the first game of the 2007 NBA Finals. Although he admits to still feeling "a bit sore", Gasol has been cleared to play and will be in the starting lineup for Game 2. Damn Philly got a game on you?! Fire Begley! How young does Pau look!